New JioFi JMR815 is offered in Black color and exclusively available via Flipkart at rupees 999. 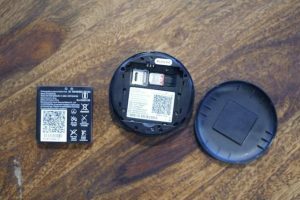 This device comes bundled with a USB cable and also a charging adapter. Alternatively, you can also use your existing Micro USB charger to charge the device. The new model, dubbed JioFi JMR815, is exclusively available for purchase through Flipkart. It comes with a one-year warranty and is touted to deliver download speeds of up to 150Mbps and upload speeds of up to 50Mbps. Moreover, the new JioFi model has a circular build with physical buttons of power on/ off and WPS (Wi-Fi Protected Setup). There are also notification lights for battery, 4G, and Wi-Fi signal strength. The device allows 32 users to connect to a high-speed data network, including 31 on Wi-Fi and one on USB. Once connected, it offers HD voice and video calls via Jio 4G Voice app on smartphones. Besides, it is powered by an ALT3800 processor and supports FDD-Band 3, Band 5, and TDD-Band 40. The JioFi has a microSD card slot that supports storage expansion up to 64GB. The device also packs a 3000mAh battery that is rated to have a charging time of 3.5 hours. 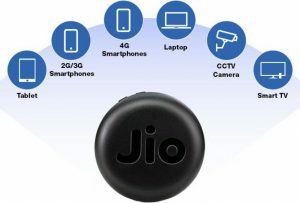 The latest JioFi model comes days after Reliance Jio launched a new JioFi rupees 1999 offer under which it offers free data and voucher benefits worth rupees 3595. The company mainly brought the JioFi at rupees 1999 with bundled data worth rupees 1295 and voucher worth rupees 2300 from Reliance Jio, Reliance Digital, and Paytm. 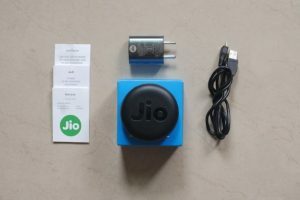 Interestingly, customers were also provided with the same JioFi device at rupees 999, without the free data and voucher benefits.